Alright, we are finally back in the Smokies! We arrived at about 4AM (extremely late arrival is a long story) this morning at A Holiday Motel (www.holidaymotel.net) in Maggie Valley. We slept for about 6 hours before getting out of the room at around 11AM this morning. 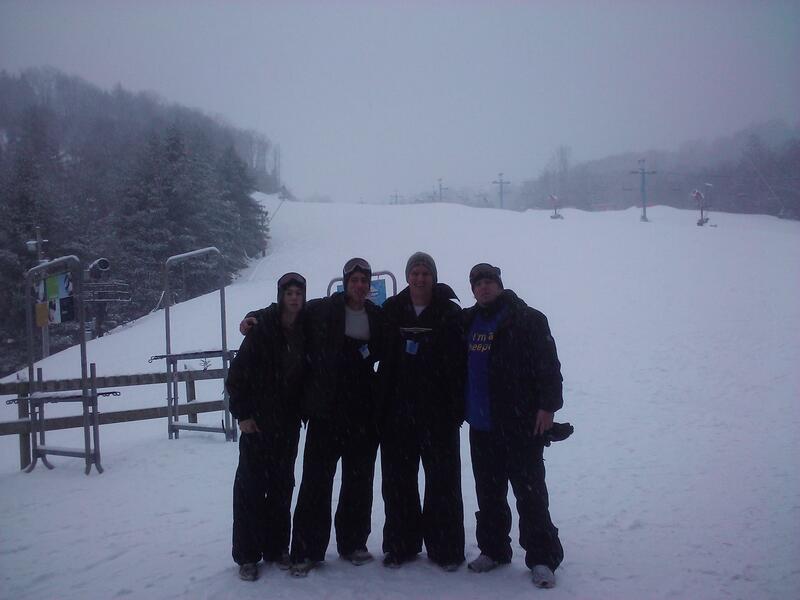 We were skiing at Cataloochee (www.cataloochee.com ) soon thereafter. There was a snow storm moving into the area. That’s good news, because that means lots of great powder. The bad news is, it snowed so hard, they had to close the slopes early. We were planning to ski until they closed at 10PM, but they had to close at 4:30PM due to the extreme snow. The snow is not a problem at the top of the mountain, but considering you have to drive back down the mountain, the snow-covered roads are the reason they had to close early. We were just about the last people on the mountain before we left. Now, keep in mind, on our way UP the mountain, just a few hours earlier, there were bits of snow on the sides of the road, but just a little white here and there. As you can see by these photos we took on the way down the mountain, the entire area now looks like a winter wonderland. 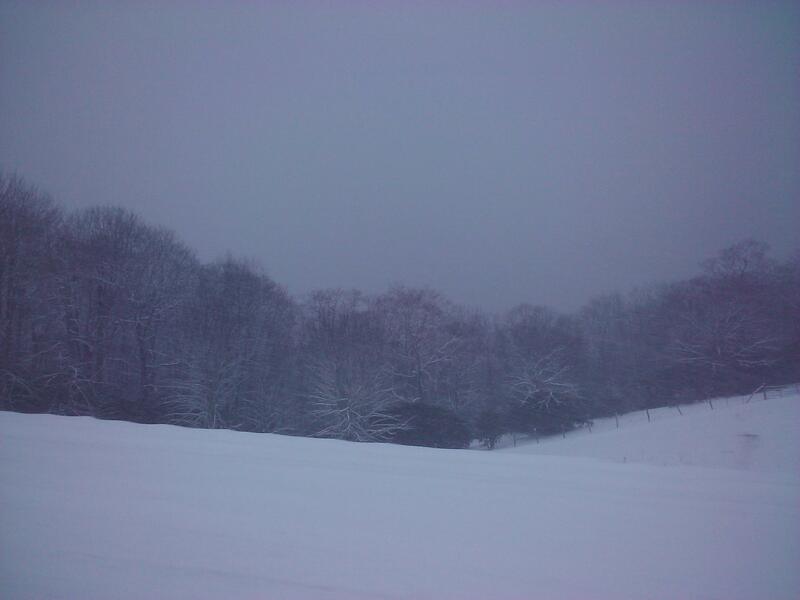 Here’s a look at some fields on the way down the mountain. 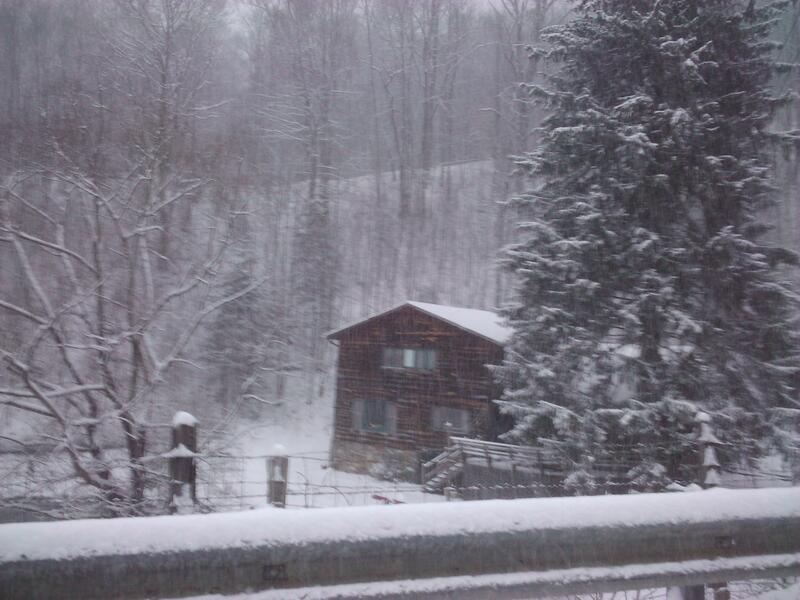 Then, another of the cabins you see along the road down the mountain. 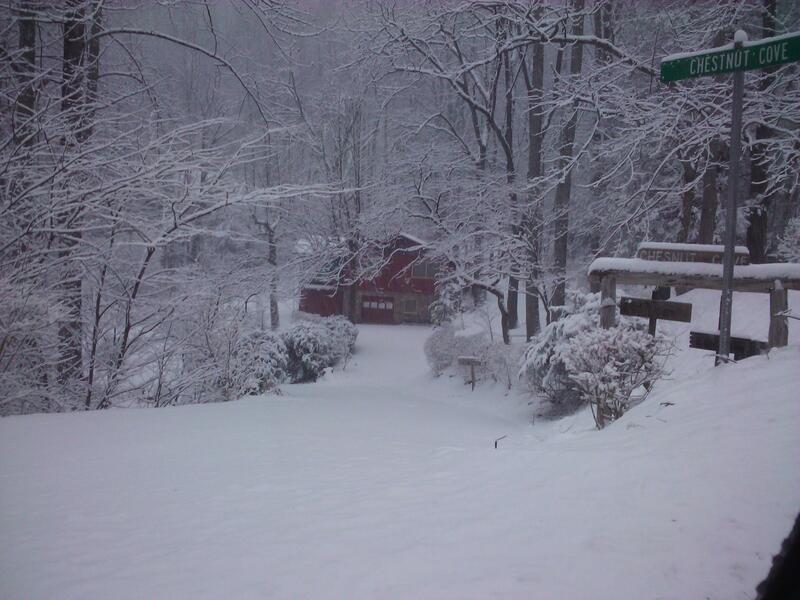 The Cataloochee folks tell us they expect lots of additional snow throughout tonight. They plan to open at 8:30AM tomorrow, and will stay open until 10PM. IF that happens, we plan to be there from open to close. We’ll post more photos from tomorrow once we get back from the slopes. Also, I wanted to let you know when we will be airing another “LIVE IN THE SMOKIES” episode of the GoSmoky.com Internet Talk Show. I will be hosting a show on THIS Sunday morning from Maggie Valley. I plan to have several guests on the show, including a representative from the N.C. Department of Transportation. He spent several days last week at the site of the rock slide on I-40. He’ll update us on the project. That “LIVE FROM THE SMOKIES” episode of the GoSmoky.com Internet Talk Show will take place this Sunday morning at 8:30AM. I will post the show link here on the blog. You can listen live, or listen to the show podcast later at the link. Stay tuned! This entry was posted in Cataloochee Ski Area, GoSmoky Trips to the Smokies, GoSmoky.com Internet Radio Show, great smoky mountains national park, Holiday Motel, January, Maggie Valley, pictures, Rock Slides, skiing, snow and tagged a holiday motel, Cataloochee, gosmoky, Holiday Motel, Maggie Valley, smokey mountains, smoky mountains. Bookmark the permalink. Looks like you had plenty of fresh powder. We didn’t ski buzzer to buzzer. The first day, we were there around noon, if I remember correctly (we didn’t get in town until about 4AM.) We were planning on staying until close, but they had to shut down the mountain at 4:30PM because the snow was falling so fast, they didn’t want us stuck up on the mountain with no way to drive down. It really was snowing like crazy, so I understood that. The next day, we got up there around 11:30 or so (just slept late:) We were literally the last people to ski down the mountain that night at around 10:15PM. A member of the ski patrol actually had us all race down in a pack (all of the last folks on the mountain.) That was a great day. We did have lots of powder, and it stayed cold enough tha we never really had any rain to slush it up. It was perfect weather for snow skiing.